Chintax is a Cape Town business that supplies computer and electronic goods. LAUREN: Our General Manager – She has been at CHINTAX for the last 15 years and is the heart of the business. MARTIN: Stores & Delivery – He is our fantastic Delivery representative who is always happy to help out. CLAUDINE: General Administration and Sales – She is part of the furniture. She is always willing to help and loves CASEPAX our branded bags. CHRISTINA: She packs the orders and sorts out the faulties and always has a smile. SUNEL: Client Liaison – Our New Friendly Sales Recruit. CHINTAX was started from new in 1993 from humble beginnings by Pam Sutton. Due to aggressive marketing and commitment to customer service, the company has shown steady growth and now has an annual turnover of 4 Million and is therefore a LEVEL 4 BEE Company. CHINTAX employs a dedicated team of 6. CHINTAX operates from purchased premises in Diep River and carries stock of approximately a million rand. 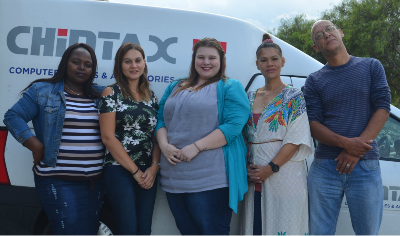 CHINTAX is the sole importer into South Africa of the Chintax range of Computer Accessories and distributor to major stationery, computer and media retail companies. CHINTAX also offers a free delivery service in the Cape Peninsula and a monthly account facility to approved dealers. Delivery to other areas in South Africa can be arranged upon request. CHINTAX offers a 1 year “no fuss” warranty on all our products from date of sale. Simply return the faulty product in it’s original packaging to our office for immediate credit. In addition, for retail stores, any over-supply from our merchandisers will be collected and credited immediately.